I'm watching the Golden Globes, so I'm not really crafting a post tonight. But in case you're not watching, I need you to know that this just happened. 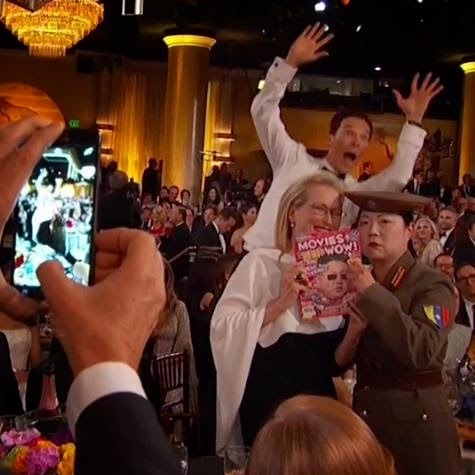 Benedict Cumberbatch proved himself the King of the Awards Show Photobomb again. Lame bit about North Korea + Margaret Cho in Commie drag = meh. Benny in a white dinner jacket = priceless. Other than that, the Globes have been a bit dull so far. He is almost at Nathan Fillion Photobomb level. Almost. But not quite.